We sell parawire, flat aluminum wire and round aluminum wire in multiple colors and gauge sizes. 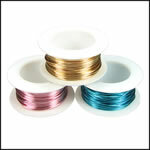 Parawire is perfect for any jewelry project, and is popular for wire wrapping precious stones. Our flat aluminum wire can be curled, twisted, and molded to make wire rings, bangle bracelets, earrings or necklaces.